Earl Grey School is one of school architect J. B. Mitchell’s most spectacular designs—huge, beautiful, and expensive. 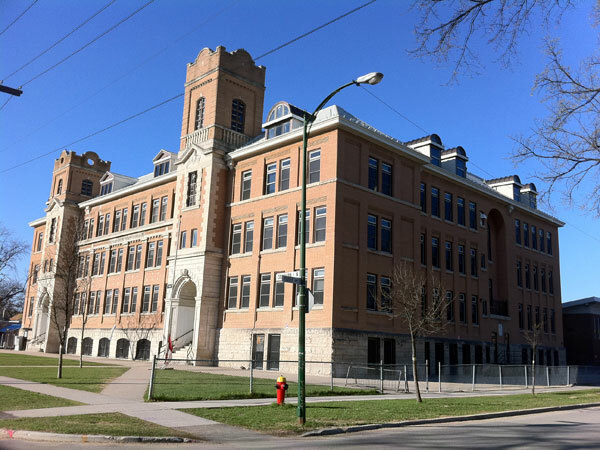 Settled handsomely at the corner of Cockburn Street and Fleet Avenue and towering above its Fort Rouge neighbourhood, three-storey Earl Grey is truly one of Winnipeg’s grand old schools. Costing nearly $160,000 to build, construction began in 1914 during the city’s boom time when population growth was exploding. The first students attended in September 1915. Its impressive façade with the pair of asymmetrical entrance towers is loaded with elegant details. It had 29 classrooms, five special classrooms, and an assembly hall. The school was named after popular Governor-General of Canada Lord Earl Grey who served from 1904 to 1911. An avid sports fan, the Earl initiated the Grey Cup in 1909. 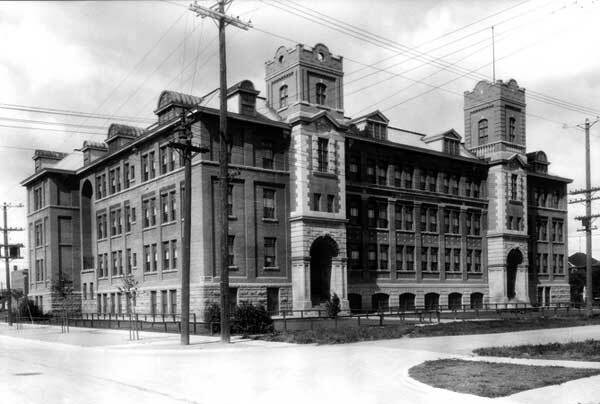 In 1919, Earl Grey School became the site of a major educational innovation—it was the first Junior High School in western Canada. Over its ninety-three-year history, the school has produced many illustrious alumni. Former Winnipeg Mayor Robert Steen, media philosopher Marshall McLuhan and musician Neil Young all attended Earl Grey. At one time, both signatures on Canadian paper money were Earl Grey graduates: James E. Coyne was a former Governor of The Bank of Canada, and John R. Beattie, a former Deputy Governor. The building is a municipally-designated historic site. Elementary Department: Miss K. Burns, Miss G. Burton, O. Ferris, Mrs. S. Garvey, Miss R. Holland, Mrs. P. Kirk, Mrs. R. Lapp, Miss E. Larson, Mrs. G. Leggatt, Miss F. Martel, Miss M. Masson, Miss G. McInnis, Mrs. D. Smith. Secondary Department: Mrs. E. Bardal, D. C. Dilk, Miss M. Dutton, P. Friesen, Miss I. Grierson, Mrs. B. B. Groberman, D. Hrabiuk, H. Jersak, Miss P. Kapey, J. Nolan, A. Prestayko, Miss G. Puttaert, ? “Board appoints 817 teachers to schools in city,” Winnipeg Tribune, 30 August 1921, page 2. “Winnipeg schools, No. 31—Earl Grey,” Manitoba Free Press, 21 November 1922, page 13. “905 teachers will instruct city pupils during next term,” Winnipeg Tribune, 1 September 1922, page 6. “Teachers assigned,” Winnipeg Tribune, 31 August 1923, page 3. “Teachers are assigned for new term in public schools,” Winnipeg Tribune, 30 August 1926, page 10. “Winnipeg schools to re-open Sept. 1 – changes announced,” Manitoba Free Press, 31 August 1927, page 7.